← Christmas Knits: Another FO! Ok, so not really. It was nice and chilly this weekend, though. After 100+s, 90s, and 80s, the 50/60s on Saturday and Sunday were absolutely heavenly. All I felt like doing was knitting all weekend long. That didn’t quite happen. Saturday morning, husband and I got up at 6am (well, I got up at 6 and got him out of bed by 7-ish) to get ready for the annual Heart Walk. My mom works at one of the local hospitals, so we walked with them. We didn’t quite make it the whole way. To me, 3+ miles really isn’t that bad, but others in our group wanted to turn at the halfway point. The good thing is that that’s completely allowed. I did track it, and we walked over 2 miles, which isn’t too bad. Once husband and I got home, we stayed home. I had started another Meret in a mystery yarn earlier last week. (Mystery because I inherited a lot of acrylic yarn with no labels. I could tell by touch what the orange yarn was, but I have no idea about this one.) I love this pattern. I worked on it steadily through Saturday and before going to bed, I had cast-off and woven in the strands. I’m thinking that since this is such a fast and easy pattern, I’ll use this and maybe one other to take care of my Christmas list. Speaking of Christmas! See that piece at the top of the post? Yes, that is a stocking! I managed to knit about 3-4 inches last night on it, finally getting into the colorwork. In fact, I’m halfway done with the colorwork. I’m not entirely sure how the whole stocking is going to turn out. I’m trying a lot of new techniques, like the afterthought heel, so it’s a lot of guesswork. 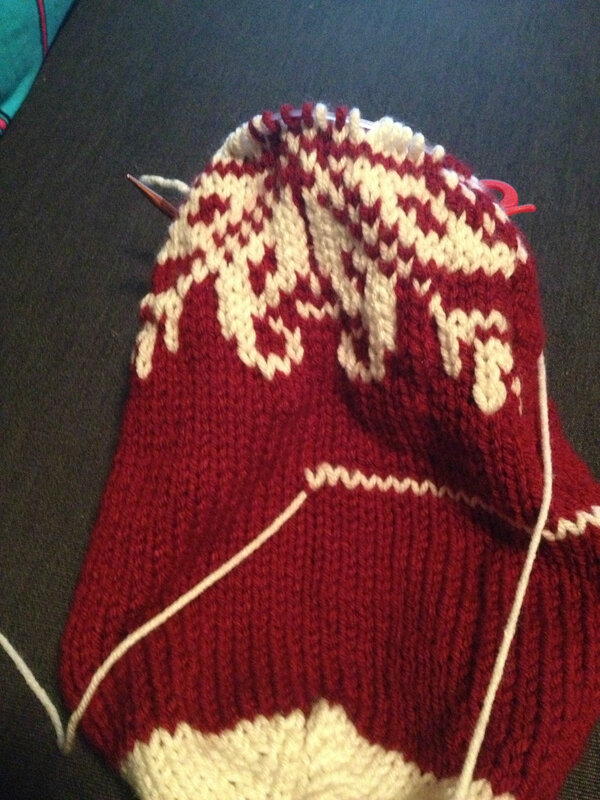 I’m using a motif I found in Alice Starmore’s Book of Fair Isle Knitting. The yarn, I think I mentioned before, is I Love This Yarn from Hobby Lobby. And do I! The yarn is soft and squishy, which is something I always like in yarn. This would make a great hat or comfy mittens, too. Or slippers! On top of all that, I got 5 more bags of books ready to send to Goodwill. Our spare room is slowly but surely clearing out. I can’t wait to have one room under control. Then I have to move to the rest of the house. Maybe the living room next. The nice thing has been finding things I’ve owned but haven’t been able to find. For instance, I have a lot of plastic boxes that turn out to be a great fit for knitting projects. They stack neatly on top of each other and keep all the materials I need for each (smaller at least) project. This week I plan to finish one stocking and start planning the next. I also should probably start either a scarf or shawl or some other Christmas present on my list. I’ve thought about just focusing on all the hats so I can get those done right away. Also, we’re on week 3 of adventurous cooking! This week I have eggplant, artichoke, leeks, turnips, and asparagus. This should be fun! Did you have a good weekend? What projects are you working on?